Reliance Jio juggernaut: What next in this game of thrones? Mumbai: Reliance Jio Infocomm Ltd is making life miserable for everyone—everyone, barring the consumer, that is. While four telecom firms have already folded up, Reliance Jio’s massive push to provide Indians with digital oxygen—which is how it refers to broadband data—is cutting the lifeline of even India’s largest telecom firms, including market leader Bharti Airtel Ltd. Indebtedness at Vodafone India Ltd and Idea Cellular Ltd has reached unwieldy levels. The only hope for investors and lenders is that tariffs increase from current levels. But Reliance Jio itself seems content with current tariff levels. It has a lower cost structure compared to incumbents, and has been reporting profits in its wireless business. Besides, it hopes to recover a large part of its costs from the fixed broadband business, which is yet to be commercially launched. Then, there is the aspiration of being a platform business, which, according to some investors, will bring limitless opportunities. What, then, could cause Reliance Jio to relent on pricing? If it does not and stays with its disruptive instincts, will other telcos survive? “The current pricing in the telecom market is great from a consumer’s perspective… it is not great from a lender’s perspective. We have to be very, very cautious while taking exposure to the telecom sector," Rajnish Kumar, chairman, State Bank of India, said in an interview with Mint recently. Much to the dismay of investors in telecom companies, there is no sign of an increase in tariffs. On the contrary, downward pressure on tariffs has continued unabated. Average revenue per user (Arpu) of Bharti Airtel Ltd fell sequentially by another 6% in the June quarter. Its Arpu has fallen 44.3% since Reliance Jio launched services in September 2016. Things may only get worse. Reliance Jio has only recently targeted the postpaid segment, which accounts for over a fifth of incumbents’ revenues. Besides, in early July, Reliance Jio announced a huge cut in the cost of owning the Jio Phone, a feature phone targeting incumbents’ voice-only users. The impact of these moves is yet to be seen. The Reliance Jio Phone was launched last year, and the price cut suggests sales weren’t up to the company’s expectations. “It’s clear that Jio gets aggressive on pricing when a product or offer doesn’t meet its expected response. The worrying bit is that it is aggressive even after a product meets its expectations," says an analyst at a domestic institutional brokerage. A case in point is the mainstay smartphone segment, where the company has had unprecedented success, with 190 million subscribers within less than two years of its launch. Still, pricing in the segment remains highly competitive. As SBI’s Kumar says, customers have never had it so good. Before Reliance Jio’s launch, Airtel’s data customers shelled out around ₹ 225 for every gigabyte of data use. In Jio’s flagship plan, each GB of data costs a little over ₹ 3. Jio itself had envisaged data to cost ₹ 50/GB when it launched services, as well as when it laid out its vision for the year 2021. The fact that current tariffs are at a fraction of those levels suggests the cost of acquiring a decent market share has been far higher than what Reliance had initially thought. After two years of cut-throat pricing, Reliance Jio is estimated to end up with a revenue market share of around 23% in the June quarter. But it is still far short of its target of a 50% market share. Having invested as much as $40 billion already, it looks highly unlikely now that it will settle for anything less in terms of market share. To reach its target, an aggressive pricing strategy will be a necessity. Reliance Jio “will strive to double subscribers to 400 million before raising prices," Kunal Agrawal, a Hong Kong-based analyst with Bloomberg Intelligence told Bloomberg News. That would mean intense price competition for another two years at least. While the general narrative squarely blames Reliance Jio for driving down tariffs, Reliance Jio itself believes the truth lies elsewhere. In its books, incumbents were to blame for the downward revision in tariffs in January this year. “People have missed the fact that it (the tariff revision) was in response to some of our competitors reducing prices. This has been very consistent with what we said—if someone matched our prices, we will give 20% more value," Srikanth Venkatachari, joint chief financial officer of parent company Reliance Industries Ltd, said in a press conference while discussing December quarter results. Vodafone and Idea’s statements this year suggest they have nothing to do with the price war, thereby indirectly putting the blame on Airtel. “India remains challenging, as a result of intense competition between the new entrant (Jio) and the current market leader (Airtel)," Vittorio Colao, chief executive officer, Vodafone Group Plc, reiterated in a conference call with analysts on 25 July. This June, Airtel seemingly ignored the counsel to keep cool and offered sops selectively to retain some customers. Reliance Jio returned fire by increasing data allowances for nearly all its plans, albeit temporarily. Now, from the looks of it, Airtel too seems to have concluded that it’s pointless trying to come too close to Reliance Jio’s comfort zone. It is keeping a distance either in the form of lower data allowance or lower validity in cases where its tariffs are similar to Reliance Jio’s. 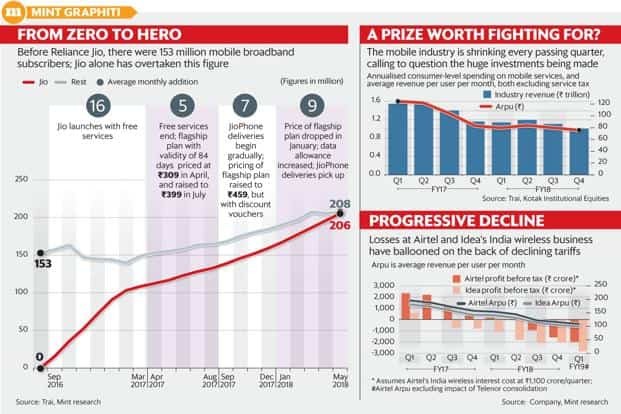 Nevertheless, the June quarter results make it evident that Airtel is the most aggressive among the incumbents currently—its subscriber count rose 4% organically last quarter, compared to a 1.6% decline for Vodafone India and a 3.4% decline for Idea. Not surprisingly, cut-throat pricing in the sector has resulted in heavy losses for incumbents. In Idea Cellular’s case, operating profit in the June quarter was less than half its interest costs. The losses aside, the liberal data allowances have also forced incumbents to make large investments in their network, to ensure there is adequate capacity. Incumbents are being squeezed at both ends. The pressure on tariffs has dried up cash flow from operations, forcing companies to raise funds from the market at a time when valuations are beaten down. For Idea and Vodafone, funding constraints are leading to losses in subscriber and revenue share. In the June quarter, Idea’s capital expenditure was ₹ 980 crore, merely 6% of Reliance Jio’s capex and 14% of Airtel’s spend. Reliance Jio has already raced past Idea and Vodafone to become the second-largest telecom in the country in terms of revenues. It looks like much of its incremental market share from here on will come from them. Also read: Is Reliance Jio really India’s most profitable telecom firm? For all the plight of incumbents, Reliance Jio has postured itself as a company that is in a league of its own. It has reported profits for the past three quarters, making it look like incumbents’ woes are because of an unwieldy cost structure linked to the use of technology from yesteryear. While it’s true that Reliance Jio’s cost structure is relatively low, there are other reasons for its profits. Importantly, since 1 October 2017, it has saved substantially after Telecom Regulatory Authority of India (Trai) cut interconnection usage charges (IUC) by 57%. Without the IUC cut, it may well still have been reporting losses. Besides, Reliance Jio still capitalizes about a third of its operating expenses and the majority of its interest cost, citing that all of its business segments aren’t yet operational. Then it has a unique depreciation policy. Whatever the reasons, if Reliance Jio and its investors believe its wireless operations are indeed profitable, there is little hope that tariffs will be raised anytime soon. Perhaps, what can change its mind is the response to Reliance Jio’s other business plans, such as home and office broadband. For instance, it has targeted 50 million home broadband connections with JioGigaFiber, far higher than the entire industry’s subscriber base of around 18 million. Airtel’s home broadband subscriber base has hovered around the 2 million mark for two years now, despite a 22% drop in Arpu. Reliance Jio may either need to settle for a far lower target or offer exceptionally low tariffs to grow the market. If the revenue from this business is lower than its target, the onus will be on the mainstay mobile business to cover costs. In the June quarter, while Reliance Jio again reported a profit, it also burnt cash of ₹ 13,800 crore, higher than the outgo of ₹ 11,300 crore in the March quarter. At some point, its investors will start asking questions on when cash burn will stop. But again, these questions may be some time away, as the fixed broadband business is expected to ramp up gradually. Similarly, revenues, if any, from the various platforms Reliance Jio plans to run will also take a long time to come about. In any case, Reliance’s investors are displaying a great amount of patience with its large investments in Reliance Jio. These have depressed parent company Reliance’s return ratios. But none of this has mattered to its investors, who are betting on a glorious future when Reliance Jio will rule not only India’s telecom market, but potentially also other areas such as e-commerce. Whichever way one looks at it, incumbents have to be prepared for a long and arduous journey back to profitability. At the Hindustan Times Leadership Summit last year, Mukesh Ambani, chairman of Reliance Industries, was asked to respond to the criticism that his company had destroyed enormous value in the telecom sector. For incumbents and their investors, his reply was far from comforting: “As long as the consumer gains, and the country moves forward, it’s worth taking those losses. Some of us are big boys; we can afford that." While it’s true that only the big boys are left in the telecom industry, not everyone views losses the same way. Vodafone has already planned a partial exit from India. If losses remain too high for too long, who knows how long the patience of telecom firms and their investors will last.